When Erica Barry meets her daughter’s womanizing boyfriend, Harry Sanborn, a life-changing event causes her to go from work to love back to work back to love and back and forth because, in order to have it all, something’s gotta give. I’ve spent my whole life trying to achieve balance. I have my monthly to-do list, my weekly to-do list, and my daily to-do list. At first, I would check to-dos off my list, then I would cross them out, now I highlight them in green. In one of my seminars, I give out a balance wheel. Participants look at twelve areas in their lives, measure how they spend their time versus how they would like to spend their time, then shift their priorities to find balance. Sounds nice, right? My balance wheel results: for many years work had been my priority and my health had suffered for it. I also noticed that I wasn’t connecting with my family. Reworking the wheel felt great! Putting family first, health second, rearranging the other ten pieces of the pie until it looked perfect. My cherished family time was definitely number one and I was taking great care of my health, spending two hours in yoga, working out, eating well and meditating. But, work and financed suffered. What?!?! I was taught when I achieved balance and I had my priorities in order that everything else on the wheel would flourish as well. Yup, I trusted what I was taught. Now, I look back and wonder, “Why did I think that was possible? How could I have been so naïve as to believe that?” It reminded me of when The Secret came out and people started thinking they could sit in their living room, focus on a pile of money appearing before them and it would. They missed the point of the film/book which was you get what you focus on, BUT you have to act in order for that focus to create the outcome you desire. My belief was if I focused my energy on what was most important (family and health) everything else would magically flourish? I’m literally shaking my head in disbelief right now that I could have gotten it so wrong. I followed that wheel plan every day… clearly “something’s gotta give,” and in my case, it was my work. I rearranged the wheel so that family, health, and work were priorities. Following that wheel, I burned myself out and on top of that one of my greatest desires (to find love) was completely out of the picture. Once again, feeling proud of what I’d accomplished with work and cherishing my family time, I found them both harder to enjoy because while I was exercising and eating well, I was still exhausted and quite frankly lonely and wishing I had someone with whom to share the fruits of my labor. Something’s GOTTA GIVE!!! We all have the same twenty-four hours a day. If I gave you my balance wheel to fill out every day, perhaps every hour, it would change. Wake up and write out my 3 priorities for the day. If my day shifts and something’s gotta give, I re-prioritize and recognize that whatever task didn’t get done, will be finished at another time. No beating myself up for what didn’t get done! Before bed, acknowledge my day, what I accomplished, what I am grateful for, and say my prayers. Then off to sleep knowing tomorrow’s a new day with more opportunities to live my life as I choose. With this new outlook in mind, if I re-examine the film, Erica was doing just this. She would wake up one morning and, her priorities would be walking on the beach for exercise, writing her play, spending time with her sister, and the next day, her daughter’s MUCH older boyfriend has a heart attack in her house and Erica has to reprioritize everything to care for him, love him, and lose him… of course, there’s a lot more to the movie including LOTS of laughs and a happy ending, so if you haven’t seen it, please do! If you do choose to play along with me, I’d love to hear what you think of this new system and how it’s working or not working for you. You can email me or leave a comment. ps If you want direct access to me and feedback on your progress, join my Insider Circle HERE. You’ll receive access to our private Facebook group. 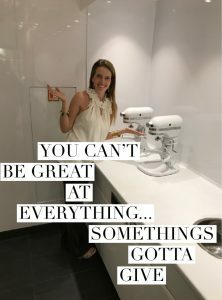 pps… if you’re hesitating on this great opportunity that gives you direct access to me and is tailored to your business needs, maybe you need to shift your mindset. I have a free webinar on the 5 Mindsets for Success that you can access HERE. This includes: (1) contacting us through a contact form (2) ordering any product, (3) downloading any item, (4) signing up for the mailing list and/or any notifications. (5) comments on any site content. CAPTAIN MARVEL; Are You an Everyday Superhero? Sign up to receive personal emails from me to inspire, motivate & empower you PLUS my eBook "Are You a Pain in the A**? 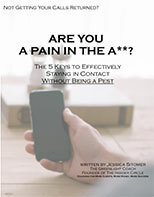 The 5 Keys to Effectively Staying in Contact, Without Being a Pest"